The red Scorpion fish can grow up to 60 cm, but the common length is from 20cm up to 30 cm. Its colour is very variable, due to the fact that is a mimetic fish; usually is brown-greenish- red with darker spots. Also black qualities are available. Despite the difference in colour the fish remains of same value. The smaller scorpion fish called "scorfanotto” is instead less valued. Due to its excellent meat it is very requested and hunted from many divers, however difficult to catch due to its mimetic aptitudes, and its poison on the dorsal spines. It is suitable for many preparations: simply boiled, in the soups, filleted. Unfortunately it is also very bony, so a careful cleansing is required. 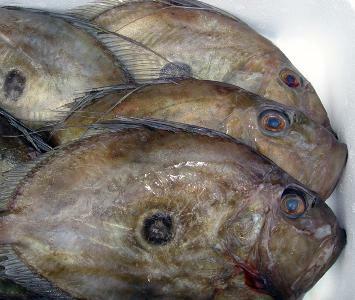 John Dory, or John Doree, a saltwater food fish. It is found in the eastern Atlantic and the Mediterranean; a very similar species is found in the western Pacific. A myth tells, that Saint Peters caught the John Dory and left his fingerprints, which we know as the dark blotches on each side of the fish. Due to distressed noises while being caught, St. Peter tossed the John Dory back into the sea. The John Dory is considered an incredibly odd-looking fish, due to its oval, flat body and a large, spiny head. The flesh is delicate and mild and can be cooked in a variety of ways including grilling, sautéing and poaching. The Label is a proof of quality for the consumer, certified by independent experts, under the supervision of the Agriculture Administration (The French Ministère de l’Agriculture), the label is the warranty of the specifications. This warranty is achieved with numerous tests and controls at all the different steps of production. The Label Rouge is the only official quality label that requires mandatory testing of product flavor. It is accorded to products with a superior taste and flavor compared to products of the same category. Products are judged objectively for organoleptic criteria, by a jury of consumers and product experts. 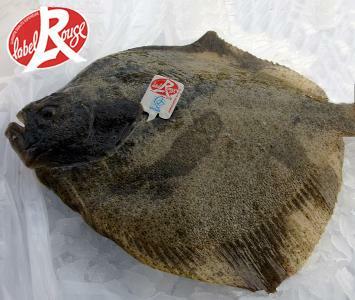 With its finesse and firmness of flesh, a light, delicately iodized aroma, and a low fat level from 1,5 g The Turbot never ceases to surprise and delight lovers of delicate fish. The Atlantic Cod, which can change color at certain water depths, has two distinct color phases: grey-green and reddish brown. Its average weight is 5 kg to 12 kg but specimens weighing up to 100 kg have been recorded. 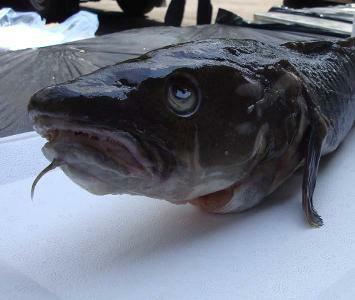 Cod is one of the world's most important commercial fish. Cod is a flaky fish and is good fried, baked, and poached. Slow cooking also works well to coax out the delicate flavors. For those trying to eat healthier, cod makes a great low-fat, low calorie meal. Codfish is extremely versatile and healthy; once you know how to cook codfish, the sky's the limit. Incorporate it into your menu for a healthier lifestyle. Red Snapper also known as Redfish, Nannygai, Golden Snapper, Swallowtail and Nanny. 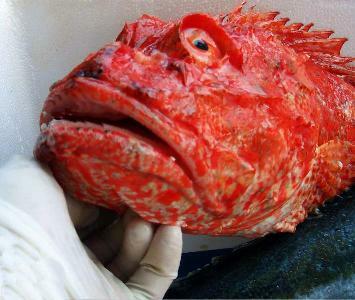 Red snapper is a schooling fish, related to Alfonsino, found around the coast of northern New Zealand from depths of 10 to 400m. Their length is between 30 and 40 centimetres. It is mostly caught as a bycatch in the longline fishery for snapper. 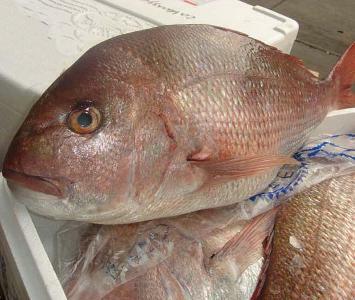 Red snapper are a prized food fish Snapper comes in many sizes, making it very versatile. It is excellent as a buffet piece, whole, filleted or as cutlets. Snapper is superb smoked and is also becoming popular for sashimi.